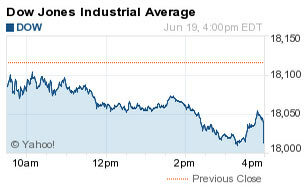 The DJIA today fell 101 points as investors weighed ongoing debt drama in Greece. The S&P 500 Volatility Index (VIX), the market's fear gauge, jumped 5.8% today. What Happened in the Dow Jones Today? Why the Dow fell today: Today's trading session fell victim to quadruple witching, a period when volatility often spikes in the final trading hour thanks to the expiration of options and futures contracts. Meanwhile, events in Greece have prompted the European Union's ministers to host an emergency meeting next week to stave off default. Oil slips: WTI oil pricesfell 1.5%, dipping below $60 a barrel today as Greek debt negotiations and a looming deadline in Iran's nuclear deal put pressure on the energy market. Brent oil dropped more than 2% to dip below $63 per barrel. IPOs surge: The IPO wagon continues to power along at a breakneck pace. On Friday, Fogo de Chao Inc. (Nasdaq: FOGO) became the fourth restaurant group to go public in 2015, and investors were hungry for a profit play. Shares of FOGO surged more than 28% in its market debut. So what is the next IPO that you should watch? The biggest IPO story right now is home rental giant Airbnb, but not for the reasons why you might think. Here's the full story why the Airbnb IPO date is in jeopardy, even while the firm recently received a $24 billion valuation. On tap next week: On Monday, investors will keep a close eye on an emergency meeting of European Ministers over Greece's $1.8 billion debt to the International Monetary Fund (IMF), and the May existing home sales report in the United States. Earnings to watch: Companies reporting earnings include Carnival Corp. (NYSE: CCL), Ennis Inc. (NYSE: EBF), and Micron Technology Inc. (Nasdaq: MU). Stocks to Watch No. 1, FIT: Shares of Fitbit Inc. (NYSE: FIT) rallied another 9.5% today as the company continues to surge after its very successful IPO on Thursday. The tech company saw shares jump more than 50% Thursday and now push to a valuation just shy of $6 billion. So, how does Fitbit make money? Find the answer, right here. Stocks to Watch No. 2, CAG: Shares of ConAgra Foods (NYSE: CAG) were up more than 10.8% on news that activist hedge fund Jana Partners has built a 7.2% stake in the food manufacturer. The fund said CAG shares are undervalued and announced intentions to nominate three directors to the ConAgra board. Stocks to Watch No. 3, MAC: Shares of Macerich Co. (NYSE: MAC) fell more than 6.6% on news that Simon Property Group (NYSE: SPG) has dropped its ownership stake in the firm. Macerich is the nation's third-largest mall operator and continues to face increased challenges from online competition and collateral weakness of its retail clients' performance in recent months. Stocks to Watch No. 4, HSY: Shares of Hershey Co. (NYSE: HSY) slipped more than 3.6% on news that the company slashed its 2015 sales forecast and announced it will eliminate 300 jobs. The company said it continues to face challenges in China and other foreign markets due to a stronger U.S. dollar. Excluding Forex fluctuations, Hershey said it now expects 2015 revenue to increase by 4% to 5%, down from its previous estimates of 6% to 7%. Stocks to Watch No. 5, KBH: Shares of KB Home (NYSE: KBH) surged 9.4% on news that the homebuilder beat first-quarter earnings estimates, reporting a per-share gain of $0.10. This beat analyst expectations by one penny. The company said it benefited from a boost of high-priced homes. KB shares will be back in focus on Monday when May's existing home sales report will be released.